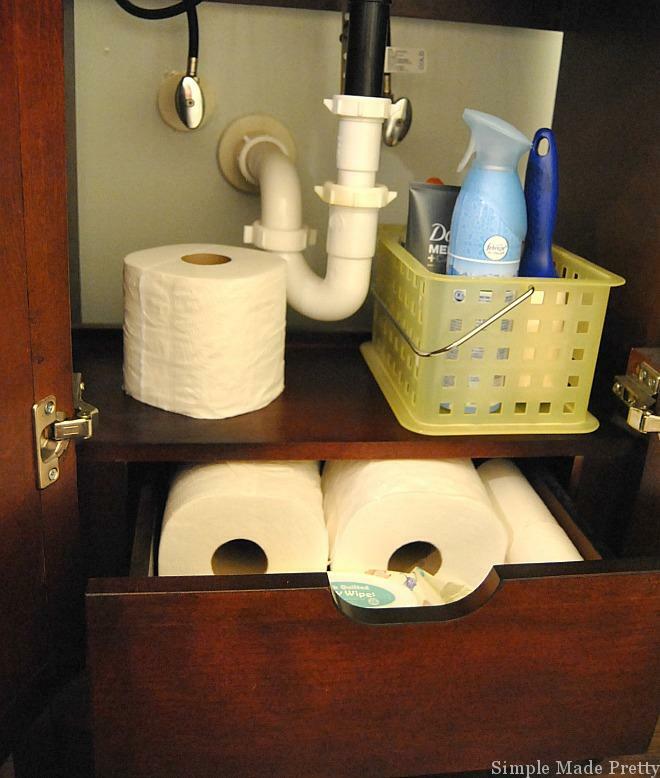 Organizing under the bathroom sink may seem like an easy task but for many households, the bathroom cabinet can easily become cluttered. 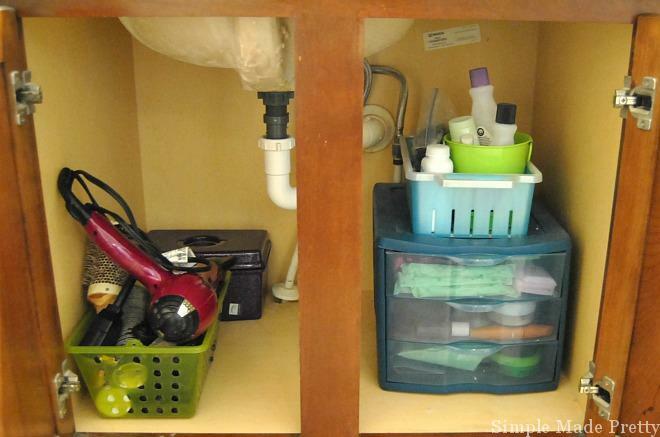 Pipes under the sink can make it difficult to organize things properly and the cabinet under the bathroom sink can become neglected and cluttered. 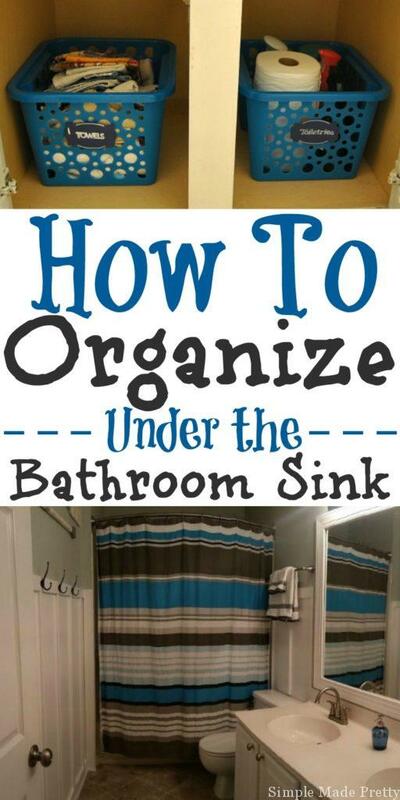 These simple tips and tricks will show you how to organize under the bathroom sink and reduce the clutter in your home in no time! 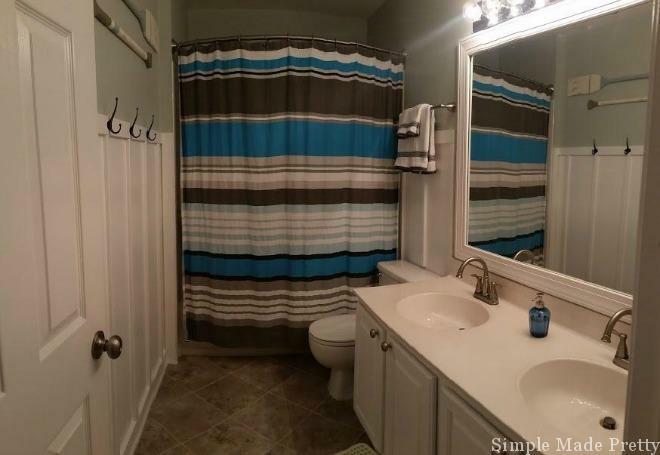 I took pictures of all 3 bathrooms in our home so you can see how I organized each space, as they all differ. 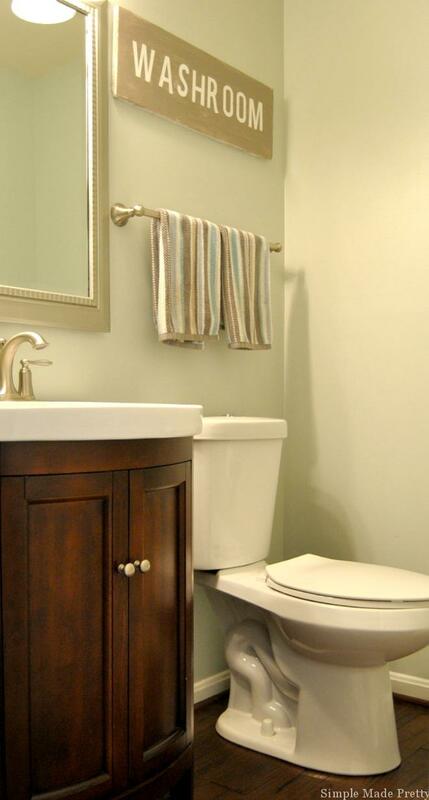 Our half bath is on the main level and is the main guest bathroom. The sink storage is limited but there is a hidden drawer once you open the cabinet so we can store additional items. 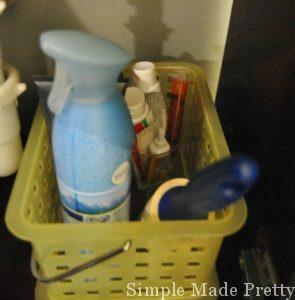 I keep a basket in the half bath for miscellaneous items like sunscreen, bug spray, band-aids, first-aid cream, hydrocortisone cream, lint brush, and fingernail clippers. It’s nice to have these items right there so we don’t always have to run upstairs. I have a small plastic cup in the basket for the small items. Of course, there is extra toilet paper under the sink and baby wipes (for the kids). Upstairs in the kid’s bathroom (which is also the full bathroom for our guests), there is a double sink so one side has baskets labeled for towels (wash cloths and hand towels) and toiletries (toilet paper, air freshener, soap, etc). The other side has miscellaneous supplies for the kids (nebulizer, paper cups, vitamins, nausea bags, barf bucket)… I know, who has a barf bucket in their home? We do! It comes in handy every time we have a sick kid. We got it from the hospital when my daughter was very ill a few years ago (they told us to keep it). If we didn’t have that bucket I would still keep a designated trash can under the sink for those times the norovirus rolls around! Our master bathroom has double sinks with a drawer in between so it’s set up like “his and hers” on each side. On my side I have a bin with all of my nail polish in the back and a basket with my hair dryer, brush, curling iron and other hair products. 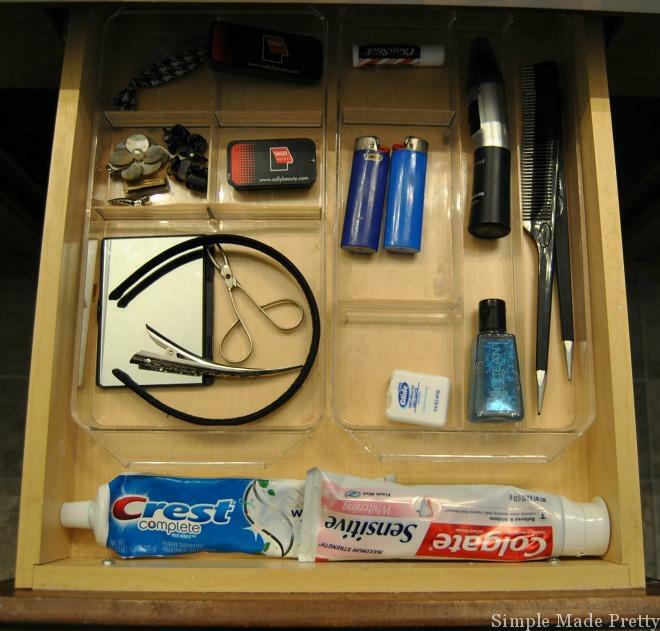 I also have a drawer organizer with makeup and feminine products. Above that is a basket with nail polish remover and lotions. The drawer between the sinks holds my everyday haircare accessories, teasing comb, toothpaste, floss, etc. On the hubby’s side, he has a basket with his hair care products, the iron and toilet paper is on his side (closest to the toilet). There’s also a bottle of bleach in the back and a fire extinguisher (we have one on every floor of our house). We have reduced all of our cleaning supplies down to a select few (made with essential oils) so our home remains chemical-free or the most part. We still have bleach (I just can’t get rid of bleach for some reason!). We keep all the bathroom cleaners in a small bin in our linen closet. Be sure to add Poison Control stickers or magnets to any harmful chemicals in your home. Sort through items and decide what you need to keep and discard items you are not keeping (or donate if possible). 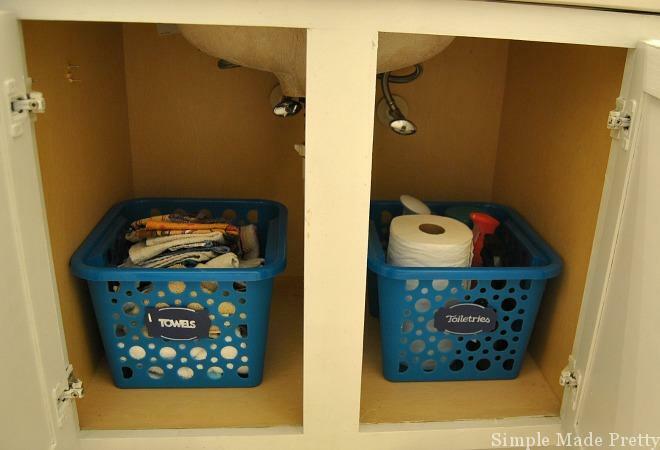 Label bins so you or your guests can easily find something. 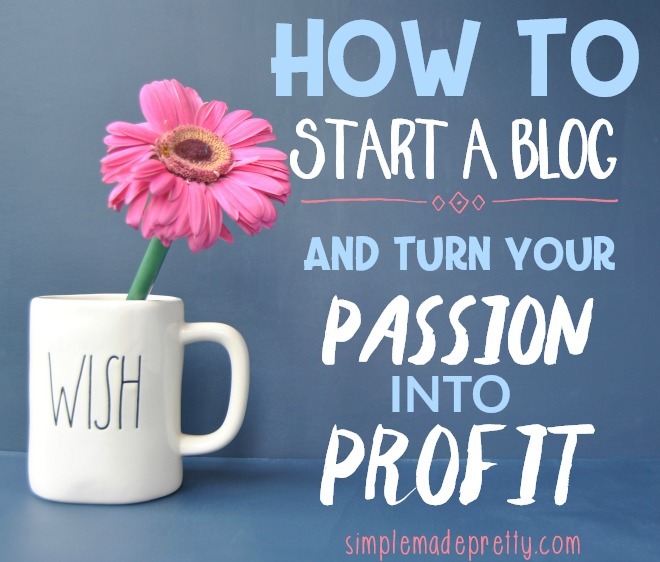 Repeat these steps every 6-12 months. 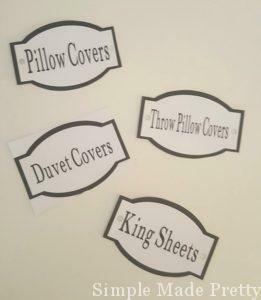 My printable bathroom and linen closet labels are perfect to use in any home. The design, shape, and color can work with any home. Print on white card stock for a clean look or print on your preferred colored card stock to match the decor of your home. My printable bathroom and linen closet labels are perfect to use in any home. The design, shape, and color can work with any home. Print on white card stock, full sheet white labels, or full sheet clear labels for a clean look or print on your preferred colored card stock to match the decor of your home. Print as many as you like after downloading the file and use over and over! 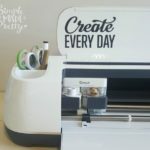 Grab the printable labels HERE to get organized! 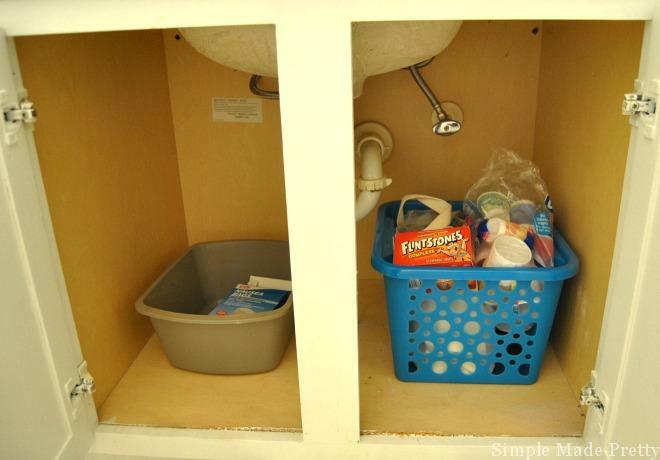 The cabinet under the sink is easy to clean and organize if you reduce the amount of items that you keep in the space. Only store items that you use on a regular basis and revisit this cabinet organization often to make sure you are not re-cluttering the space. 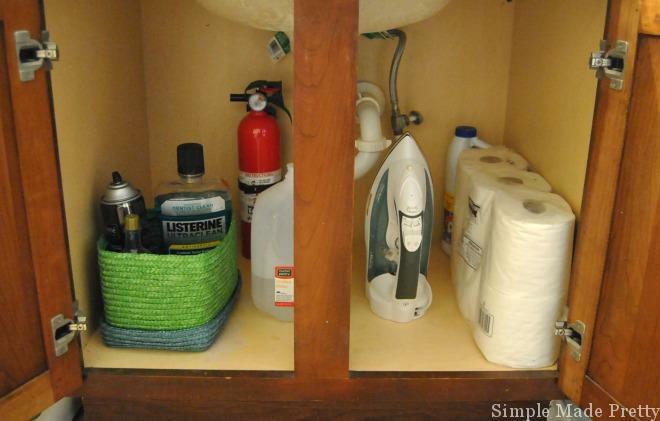 What do you keep under your bathroom sink that you use on a regular basis?